Essential oils can be defined as distilled, volatile (meaning they can evaporate at room temperature) therapeutic products made from peels, leaves, needles, seeds, roots, woods, resins, and barks. From a Chinese medicine perspective, this process of distillation, which leaves us with the medicinal essence of the plant, makes it a very powerful therapy. 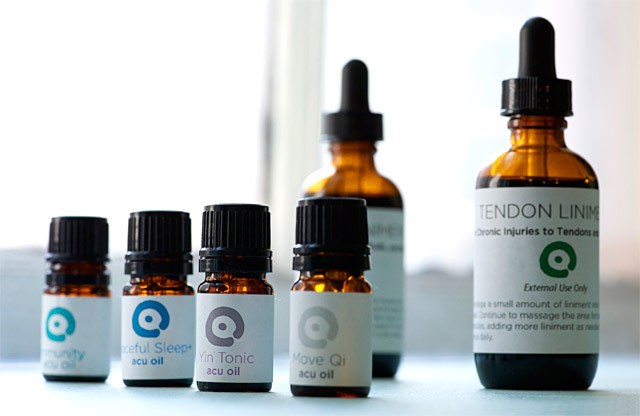 HOW ARE ESSENTIAL OILS USED IN ACUPUNCTURE? Essential oils are as old as acupuncture itself, over 2500 years. Chinese medicine understands that each essential oil affects particular organs, and has specific functions and temperatures such a warming, cooling or neutral temperature. Also there is a a level of qi that they correspond with. The essential oils are chosen according to these various properties and blends are customized to each person. The essential oil blend is then applied to acupuncture points for therapeutic effect. In most cases, essential oils are diluted in a carrier oil, such as jojoba oil, and applied to the body. 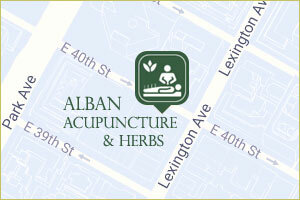 The particular essential oils and acupuncture points are chosen for use are based on a Chinese medicine assessment. For example, we may use a digestive oil on the acupuncture point Stomach 36 along with rubbing on your abdomen. Or an oil for back pain can be used on Kid 3 along with locally on your back. Combining carefully selected essential oils to apply to specific acupuncture points provides a very nuanced and effective treatment. During the acupuncture visit, the application of oils is combined with acupuncture. Also patients can take a customized blend home for daily application to a customized acupuncture point prescription. It is a great way to extend the benefits of treatment and allow for continued healing. The external application and pleasant aroma make them easy and pleasurable to use. A treatment that incorporates essential oils has tremendous potential to fend against daily stressors as well as restore you in times of acute or chronic illness. WHAT CONDITIONS ARE TREATED WITH ESSENTIAL OILS? Basically anything that is treated with acupuncture can be treated with essential oils as well. Some common conditions that respond very well are insomnia, stress and anxiety, chronic and acute pain, hormonal imbalance, skin conditions, cosmetic enhancement, and digestive issues. We have found this use of essential oils extremely effective at a gentle release of trigger points leading to rapid pain relief. Essential oils can be especially helpful when the nature of a condition involves both physical and emotional components, because studies have shown that essential oils profoundly impact the limbic system, and therefore can access parts of us that are stored deep within. Most ideas about the effects of essential oils are based upon their chemical composition providing antiseptic, antimicrobial, or anti-itching properties; or that the inhalation of essential oils improves anxiety and depression by stimulating the release of neurotransmitters such as dopamine and serotonin. [1,2] Combinations of essential oils have even helped people with alopecia regrow their hair . 1 Lv XN, Liu ZJ, Zhang HJ, et al. Aromatherapy and the central nerve system (CNS): therapeutic mechanism and its associated genes. Curr Drug Targets.2013;14(8):872-879; PMID: 23531112. 2 Edris AE. Pharmaceutical and therapeutic potentials of essential oils and their individual volatile constituents: a review. Phytother Res.2007;21(4):308-323; PMID: 17199238. 3 Hay IC, Jamieson M, Ormerod AD. Randomized trial of aromatherapy. Successful treatment for alopecia areata. Arch Dermatol.1998;134(11):1349-1352; PMID: 9828867.